Over a span of 40 years, food and nutrition research related to the benefits of eating breakfast has conclusively shown many advantages not only for children, but for teens and adults as well. Replenishing blood glucose - the brain’s primary energy source - is important. Breakfast fuels the body’s muscles for physical activity throughout the day and brings your body out of “fasting” mode. Breakfast skippers are often restless, irritable, and feel tired in the morning. Researchers at Harvard University found that breakfast-eating adults were one third less likely to be obese compared to breakfast skippers. You are also likely to find that the food and nutrition obtained from eating a healthy breakfast curbs hunger and prevents binges later in the day. Breakfast, providing proper food and nutrition, prepares children for the challenges they face in the classroom. Kids who don’t eat breakfast tend to suffer academically and are tardy more often. Breakfast-eaters have improved hand-eye coordination, verbal fluency, higher attendance levels, less tardiness and fewer hunger-related stomach aches in the morning. They solve problems more easily, concentrate better, have better muscle coordination and are less likely to be overweight. Breakfast is essential food and nutrition providing children a jumpstart on their daily requirements of calories, protein, vitamins, minerals and other nutrients. Ready to eat whole-grain, low-sugar breakfast cereal (6 grams of sugar or less per 1 ounce), fruit and skim or 1% milk. Whole-grain toast or graham crackers with a thin layer of peanut butter. Top with bananas. Whole-grain bagel with low-fat cream cheese, ricotta cheese or peanut butter. Omelets made with vegetable or low-fat cheese fillings. Grilled cheese sandwich and fruit juice. Pancakes (measure out dry ingredients and place in bags, making your own mix) or French toast with fruit topping. Fruit smoothies (try bananas, frozen strawberries, pineapple juice, yogurt and a touch of vanilla). Hot cereal such as oatmeal or grits topped with cinnamon, cloves, or nutmeg and a few nuts. Yogurt blended with fresh fruit and granola. Sliced hard-cooked eggs stuffed in a whole wheat pita pocket. Cheese pizza and fruit juice. Breakfast casserole - Try mixing the ingredients the night before, refrigerate. Making your breakfast using your Saladmaster Cookware is also a great way to start the day. Apart from the energy savings you get by cooking at medium and low heat on the stovetop, cooking your breakfast at these lower temperatures will help you preserve the important nutrition that the eating of breakfast aims to provide. The Saladmaster 316Ti 1 Qt. Saucepan is perfect for oatmeal, grits and other hot cereals. Try the Saladmaster Electric Oil Core Skillet for muffins, biscuits and french toast. The Saladmaster Square Griddle is also a great tool for making pancakes and French toast. If you prefer to begin the day with a couple of fried or scrambled eggs, the Saladmaster 8-inch Chef's Gourmet Skillet is the ideal fry pan. 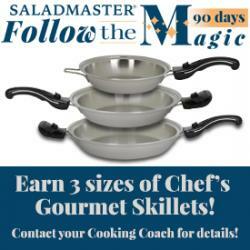 Sign up for Follow the Magic and earn 3 sizes of Chef's Gourmet Skillets! Check out these Chef Skillet brunch recipes!